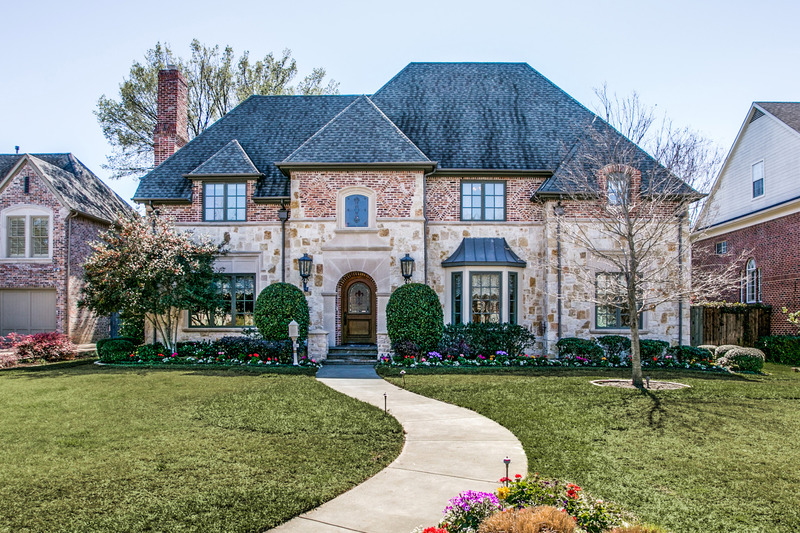 Situated in prestigious Preston Hollow conveniently near St. Mark’s School of Texas as well as shopping areas, such as Preston Center, NorthPark, Preston Royal, Preston Forest and the Galleria, 6416 Pemberton Drive is a fabulous traditional residence nestled on a beautifully landscaped lot and has fabulous drive-up appeal. With its brick and stone exterior, details include 10’-foot ceilings downstairs, gracious entertaining rooms, gleaming hand-scraped hardwoods, hand-finished walls, deep molding, elegant lighting treatments, wrought iron detailing, and fabulous granite and marble finishes throughout. Entertaining is effortless with its approximately 5,319 square feet of living space, five bedrooms, 4.1 baths, dramatic two-story entrance hall, elegant formals, intimate paneled study, chef’s granite island kitchen with premier stainless steel appliances, including Wolf, Dacor, GE Profile and SubZero, butler’s and walk-in pantries, a wet bar and an adjacent breakfast room, oversized great room with a 19’-foot vaulted, beamed ceiling, brick fireplace wall, granite-topped wet bar, a wall of light-filled windows and French doors opening to the outdoors, media room with a 13’-foot pop-up, beamed tray ceiling, bi-level seating, and a granite-topped wet bar, luxurious master suite with a 15’-foot pop-up ceiling, sitting area and a gorgeous marble and travertine bath with dual sinks, a jetted tub, separate double shower and His and Hers large walk-in closets, four additional generous-sized bedrooms with large walk-in closets and are served by three elegant granite baths, fabulous outdoor living area, including an expansive veranda overlooking a sparkling pool and spa with waterfalls and a covered loggia with bar seating and a stainless steel built-in grill and refrigerator, and a two-car detached garage completes this fabulous residence.